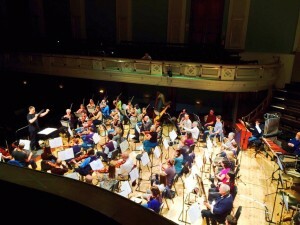 The Aldworth Philharmonic is an amateur orchestra based in Reading, Berkshire. It’s named after the founder of Reading Blue Coat School, Richard Aldworth. RBCS has been a brilliant supporter over the years and two of its former Headmasters are honorary patrons. We present three concerts per year, plus occasional extra concerts, workshops and events. This isn’t unusual, but we do think that we are a little different from other orchestras. We try to be adventurous with our programming wide range of styles from a variety of periods and composers, trying less-known works alongside the popular classics. We especially love performing music by living composers, and have commissioned nearly 5 hours of new music from our young composers award winners over the last 12 years. We’ve keep our ticket prices as low as possible and given generous concessions, where appropriate. Then, of course, there’s our famous Concert Virgin Scheme, which offers free tickets to anyone who’s never heard a live orchestra before. We’re famously welcoming at our concerts, with the musicians mingling with and welcoming audiences, and generally making the atmosphere less formal and stuffy. Our rehearsal model is project-based, where we rehearse predominantly for a couple of weekends before each concert, to allow local musicians who can’t make weekly rehearsals the chance to play. This means many more young people at the beginning of busy non-musical professional careers get the chance to play. Our rehearsals are full of laughter and fun, as well as seriously hard work. Our members travel from as far afield as Zurich to experience the ‘APO buzz’. If you’d like more information about the Aldworth Philharmonic, either as a player, an audience member, a composer, or are interested in our education work, please contact us.